Happy Saturday! I hope some of you are going to find time to stamp today! I know I plan on spending the entire day in my freshly clean and organized rubbah room! No, I haven’t gotten to move yet – still waiting on that daughter of mine to finish getting her stuff out of her room. I’d be glad to help her if she would only tell me what her schedule was – I can’t get a definite answer out of her! To give her credit where credit is due, she is a full-time college student and just took on a full-time position at her job – she is one busy young lady! BUT I’m soooooo anxious to move downstairs, just as I’m sure she is soooooooo anxious to get out on her own! 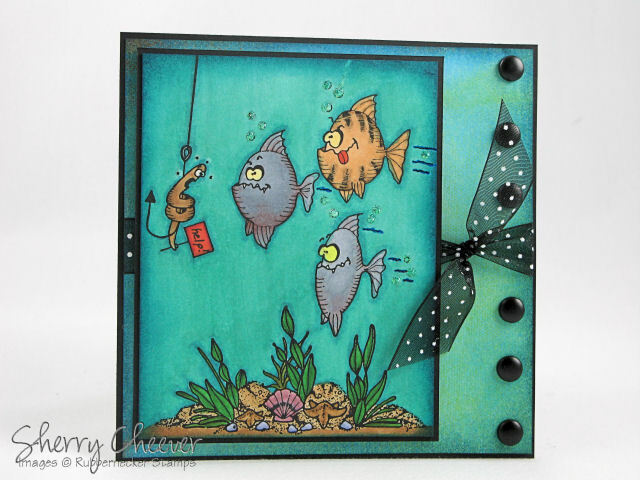 How many of you have seen the new Tickle Your Funny Bone release by Gina K. Designs? It’s called You Know You’re Old When and I’ve got to tell you, it is one of the most fun sets I’ve had my hands on in a long time. Better than the toilet bowl even – and I thought that one was hilarious! The minute I started putting ink on this set, I couldn’t stop – all I could see were cards my mother would want to send to her lady friends! Here’s one I worked up that day, on the outside it says You know you’re old when . . . And the inside says . . . Getting lucky means you found your car in the parking lot. I know my mother is going to love this one!!! The first picture I took of this card, I had striped ribbon and a bow at the top. I took it off and photographed the card again. I think I like it better without the ribbon, and it makes it easier to mail, which is very important to most of my family! Hope ya’ll have a great Saturday and get to do something that tickles YOUR funny bone! For the heck of it, I decided to show the card withe the ribbon — which do you like better? Happy Saturday!! Gina K. Designs is having a huge Release Party tonight! Gina has been showing Previews of the new sets on her blog, A Day in the Life, for the last few days, and tonight is the big party – WOO HOO! Don’t forget to stop by the Gina K. Designs Member Company Forum on Splitcoast tonight from 7:00 until 10:00 p.m. There will be contests, giveaways and much more! I have to tell ya that I’m lovin’ the new Tickle Your Funny Bone Set! 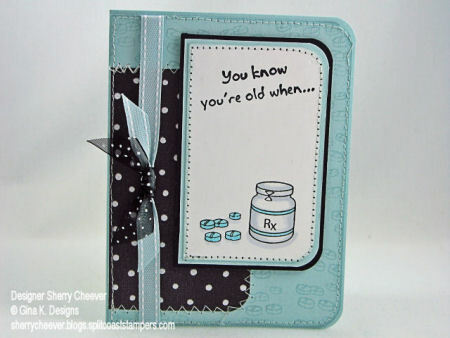 This set is perfect for little notes, birthdays and just plain, old silliness! Not only that, there is finally a set that you have an opening sentiment for the front of the card, and then when you open the card, there’s the zinger! My first card with this set . . . well you’ll just have to see it! It’s a 4.25 square tent topper card. 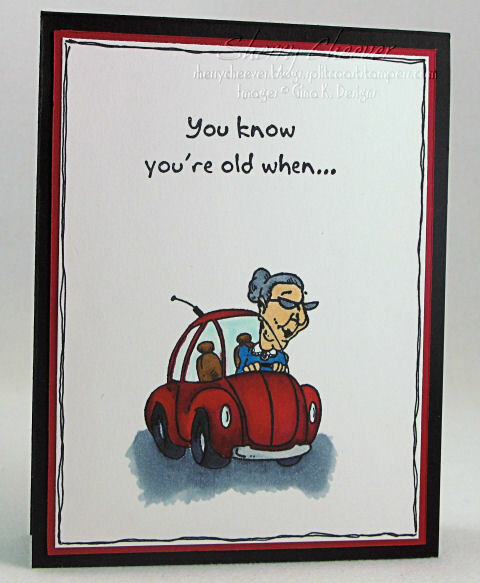 The outer sentiment reads: You know you’re old when . . . and then on the inside, your bra size is 38 long. BWAHAHAHAHAHAAHA this just cracks me up!!!! Kinda reminds me of tube socks flappin’ around! I colored the bra with Copic Markers, and there was nothing to do but color it leopard. The inner sentiment is stamped lightly on the background of the front of the card, and then stamped in black on the inside. Faux stitching was done with a black gel pen and there are liquid pearls on the outer scalloped circle. The little flower on the front of bra was glitzed up with Ranger Gold Stickles. My second preview for this set is based on a Sketch I found on Anna Wight’s blog, Sweet and Sassy. Anna I am so loving this sketch, and think that it has become my new favorite and one that I’m going to be using a lot! This time, I decided to go with the prescription bottle – notice the little blue pills sitting beside the RX bottle. Plus, there are all those little pills stamped in the background – they’re blue too! Oh this set does slay me!!!!!! 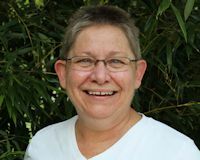 You know you’re old when . . . . everything hurts – and what doesn’t hurt doesn’t work. Yep, that’s on the inside – BWAHAHAHAHAHA! Good morning! It’s time for another JBWW Challenge. Jeanne and I decided last week that from now on, the weeks I host, you will be getting a sketch. Then on the weeks that Jeanne hosts . . . . well, it will be whatever she can dream up. Well guess what, it’s Jeanne’s turn this week and boy has she chosen a good one – Something’s Fishy! Yep, she wants you to pull out those sea critter stamps (crabs, fish, clams, etc.) and use them. Remember, to come back and post a link to either here or on Jeanne’s blog, Inky Paws, and if you are uploading to SCS, please use the keyword, JBWW. I have two different cards today. The first is using images from Rubbernecker Stamps. I stamped the images in Adirondack Pitch Black and then colored them with Copic Markers. Stickles were used for the bubbles and a gel pen used for the water flow. The background paper, Memory Box Studio, was sponged with Adirondack Stream in a circular motion over the entire paper in order to blend better with the image. 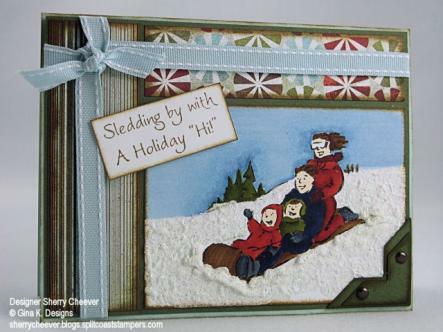 The second card today uses stamps from Gina K. Designs. The potty was stamped first and colored with Copic Markers, along with the background of the image. 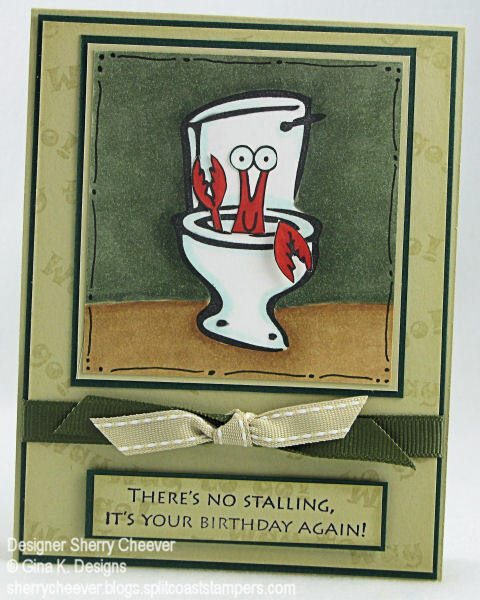 The crab/lobster (I think it can be either) was then stamped, colored and mounted inside the potty. One claw, hanging over the edge, is raised on mounting tape for dimension. 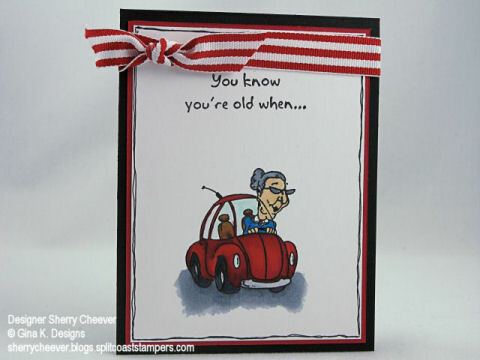 The background of the card was stamped with the sentiment Way to Go in River Rock on River Rock. A Sledding We Will Go! I can hardly believe that it’s Wednesday already! The days and weeks are flying by and Christmas and the New Year are going to be here before I am even ready. By now I normally have the house decorated for the holidays and at least have some shopping done – but not this year! I suppose I will need to concentrate on the decorations this weekend since I do have a few things happening here at the house during the holidays. I must admit that I love to decorate for Christmas and can’t bear to take it down until after the first of the year. To me the house is always bare once the decorations are taken down and put away for the year. I am struggling this year though on how to put up a tree (on the floor) and keep the puppies away from it. I’ve thought about a table top tree but can’t find just the right size. A 4-1/2 foot table top tree just doesn’t get it for the main tree in the house – especially for someone who has put up at least three trees for the last few years. Oh well, I’m sure I’ll end up with the 7-foot tree on the floor and get after the pups every time they get near it! One good thing however, is that I went through my recently made cards and realize that I’m getting close to having what I need for the Holidays. WOO HOO! AND, I can add one more in the box – I checked the Splitcoast Sketch Challenge this morning and what a fun layout. Roxie always comes up with something new and fun – I don’t know how she does it week after week. Anyhoo, here’s my card for today’s challenge. I wanted to try this image from Gina K. Designs using Copic markers instead of water coloring as I did before. Even though I love to watercolor, the colors and shading achieved with the Copics makes the images take on a different look. For the snow, I painted on some Tulip White Puffy Paint and then sprinkled on some glitter (well, a whole lot of glitter) and set it aside to dry. I used some scraps of BasicGrey Figgy paper for the small panels (as if I don’t have enough scraps of this paper by now) and Always Artichoke for the panel underneath. The edges of all the panels (except the main back panel) were sponged with distress ink. Once I had the card completely assembled, I puffed the Tulip paint with a heat gun. Oh, and as you can tell, I flipped the sketch to fit the image. Good Monday morning! My house is finally back to normal after the long Holiday weekend. Lance is finally back at work and Mallory is back at school. I didn’t realize how much I enjoy my quiet days during the week until they were all home at once. Don’t get me wrong, I love when everyone is together, but I also love the “ME” time I have during the days. Yesterday afternoon, after Mallory had left and football was on the television, I headed in to stamp. I’ve had these adorable little tins from Gina K. Designs for weeks now and I’ve been wanting to do something with them. How nice it was to work on a project just for the heck of it. To coordinate the set, I used BasicGrey Fruitcake paper and some new May Arts Ribbon that I just got from Jacksonbelle Embellishments. 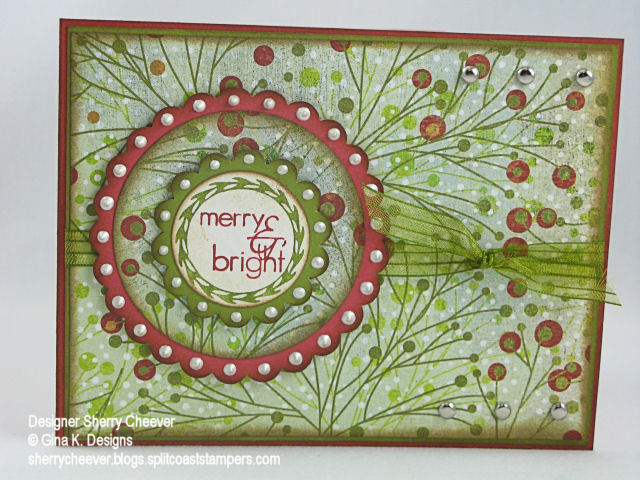 I used the Punchy Words from Gina K. Designs for the card, coloring the stamp with Old Olive and Ruby Red makers. The edges of all the paper were sponged with distress ink. Ranger Liquid Pearls were added to each scallop, just because I wanted, and each layer of the sentiment is raised on mounting tape. My first instinct was to add antique copper brads (my favorite), but then realized that in order for the card to match the tin, I needed silver. I cut strips of the Fruitcake paper. 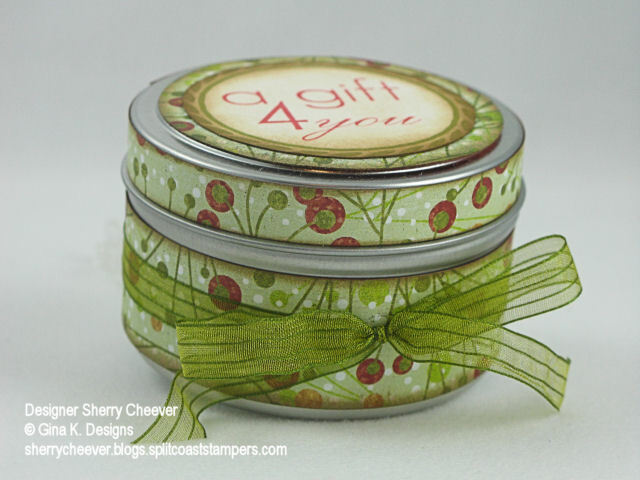 The bottom strip is 1″ wide and the strip around the lid is 5/8″ wide. The edges were sponged with the distress ink. The strips were then wrapped and fastened around the tin. I fastened the ribbon on the back of the tin with a little piece of double-stick tape and then tied off on the front in a bow. The sentiment on the top is from the Festive Labels set.